Mumbai-based Tacto Software is not even a year old but it has already developed a first-of-its kind mobile app redanar that has elicited a lot of attention from VC firms across the country. Incidentally, redanar is a free mobile service that lets you get the most out of your reward programmes in case you are using a credit or a debit card. And it's quite simple to get started. Just download the app on your iPhone, iPad or Android device, add various cards and privilege programmes and start exploring the discounts on offer around you. Best of all, you need not provide any personal information to access this service and it makes the near-location deal-hunting perfectly safe. For those, who have a Blackberry or on Nokia's Symbian platform, the downloadable app is not available yet, but they are going to be launched soon. In case you don't have those fancy mobiles, don't worry. You can still use the app through the redanar website. As the app correlates your location with your registered credit card/debit card/privilege programmes, you get to know the places where you can get the best deals and save money. You will also get SMS alerts when such deals and discounts come up within a fixed radius of your registered location. Even though technology has progressed at lightning speed, banks and loyalty programme companies still depend on traditional means like mailers (mostly sent with card statements), booklets and SMS alerts to tell customers about ongoing/upcoming deals and discounts. And the consequence is crystal-clear. One cannot take full advantage of those offers because they don't reach us in real time, neither do we know the nearest location/s to redeem those. However, two young people took note of this and after moving back from the USA where they finished their studies. Redanar founders Devang Shah and Sharmil Shah always harboured the vision of creating technology solutions that would help overcome gaps in marketing and ensure meaningful engagement with consumers. So their first job was to gather feedback from merchants, banks, family and friends before they went on to launch redanar with an aim to help the entire ecosystem of banks, vendors and consumers. "One day, I realised that I could have saved a bunch of money if I had used my platinum visa card at specific restaurants. But for that, it was essential that I should know about the offers running on my card. And I knew for certain that I was not the only person who faced this issue," recalls Sharmil. "Most often, we simply toss these fliers in the trash without a second thought. 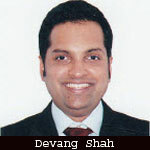 So it's hardly surprising that there is less than 1 per cent conversion of these offers," says Devang. To address this gap in communication flow and help consumers more effectively, redanar was set up in May 2011. Incidentally, Devang has earned his degrees in Finance and Electrical Engineering from the University of Pennsylvania (Wharton School) while Sharmil has got his degree in Electrical Engineering from the University of Virginia. So their background in technology and finance is an added plus for the start-up. The founders, who happen to be school buddies, did not want to use clichÃ©d expressions like offers, discounts or deals. In fact, they had always wanted something which was "fresh, short, different yet memorable." "Fruits and mobile platforms seem to go hand-in-hand these days. We got the inspiration from the app platforms â€“ BlackBerry, Apple (iOS) or Mango (Windows Phone 7.5). Redanar (red pomegranate) stuck with us and it seems to be sticking with our users as well," says Devang. The USP is an easy, relevant, location-aware experience for users to search for or discover the discounts they are entitled to. "Our USP for merchants and card/privilege programmes is higher conversion rates on their offers and promotions with targeted, location-aware marketing to SEC-A consumers," explains Devang. The founders claim that it is India's first ever location-based mobile app that helps people discover the existing offers on any privilege card they own. The technology that it works upon simply uses your location and your list of privilege cards to show you stores/restaurants/showrooms in the vicinity where you can avail of existing offers, save money and additionally, get rewarded for your everyday shopping/dining, etc. With redanar, one will no longer have to collect coupons and leaflets or note down the stores where such offers are applicable. Plus, one gets to know everything regarding offer validity and other terms and conditions. Most importantly, redanar is the first of its kind to offer such services in India. Neither is it quite a replica of any app developed abroad. Targeted customers range from banks, merchants and loyalty card programmes who want to reach out to targeted, SEC A/A+ consumers with high disposable income. Redanar will also become a tool for promotions for merchants and privilege programmes. Incidentally, companies like KeyRing and CardStar in the USA are developing similar and interesting mobile apps. There are quite a few challenges in this space but getting structured content for the app is one of the most daunting tasks. "We had to rethink our content strategy for automating the process of data importing when we realised that these programmes don't offer any structured content," says Devang. "Some offers are only available to specific card types or valid only at certain merchant locations. However, you will only find that information in the fine print. Therefore, developing a cross-platform product was really tough," he adds. "There are various nuances you have to take into account, especially when you want your app on each platform to have a consistent set of features. 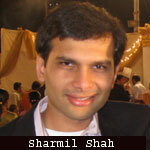 Other than this, making alliances with banks, merchants and mobile operators is also a great challenge," explains Sharmil. "We are working with some very large brands which have shown a lot of interest." Redanar is looking to raise funds to achieve its expansion goals. "We are confident that once the customer acquisition and the geographic expansion are complete, we will deliver a highly effective and contextual medium of communication to our clients," says Sharmil. But what are the next steps forward for the company? "We plan to launch in the Middle East and South Africa shortly. Our goal is to become ubiquitous with credit and debit card offers, in addition to offering details of privilege and loyalty programmes, across the world," detailed Devang while talking to VCCircle. As it is not an angel-funded company and the promoters have put their own money into the business, the company is currently run by a small team of 10. They, however, manage every bit â€“ right from developing content to looking after the business part. Right now, redanar is a pre-revenue company, focusing solely on app development and expansion mode. The firm claims to have been working vigorously towards customer acquisition across India, and even in some South-East Asian countries. Banglore-based angel investor and an observer of technology businesses Mukund Mohan describes redanar as a 'cool idea' that offers all possible deals about every credit and debit card. "Most of us don't know about the deals available for the card/s we carry," he says. Besides consumers, the app is bound to make the card issuers happy, he says. "But I am a bit confused about who provides them with the money. Will it be the credit/debit card companies or the merchants? I am pretty sure that customers are not paying," he notes. "Moreover, how are they publicising and making the app available to others?" Mohan asks. "We are doing it through social media for the time being," clarifies Devang. "Right now, we are not too worried about money. We only want to build the product and create a beautiful experience for our consumers," says Devang. "But there are several ways to monetise our highly contextual and relevant platform. Revenue model is based on the number of page views, user queries and advertising by merchants, banks and loyalty card programmes," he sums up.